Although the war over, yet thousands of Poles still encountered many difficulties and uncertainties, not being able to return to the home land they had to rebuild their lives in exile, in a foreign country, not speaking the language and in many cases were the local population were hostile and not always looked kindly on them. Yet for us children, many of whom were born in the camp, Northwick Park was an idyllic place to grow up in. Situated on the edge of the rolling Cotswolds hills, we enjoyed the freedom of living on a large country estate with its beautiful big Cotswold stone house, its orchards, its huge walled gardens stables and dairy. 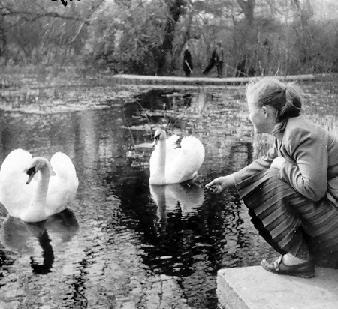 I remember cows grazing in front of the big house, played in the woods and fields, learnt to swim in the lake and feeding the swans and ducks. 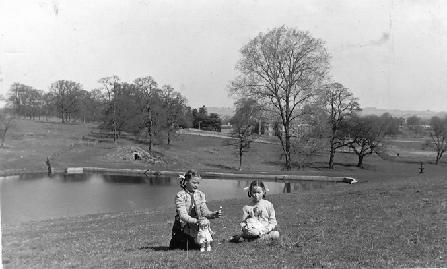 In fact there were two lakes on the estate Upper Water and Lower Water. View above Upper Water with the ice house visible. 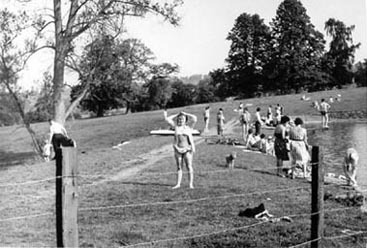 Northwick House can be seen through the trees and the camp is just visible on the right 1955. Upper Water, was on higher ground less then half a mile away from the camp. The lake had a dam across the front, this was the deep end and it was shallow and overgrown at the far end were it was fed by a spring. 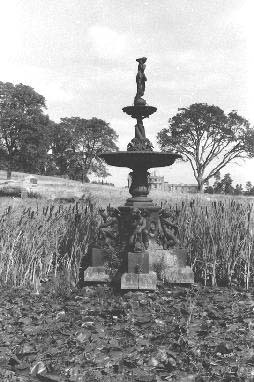 There was a stepped waterfall creating a stream at the bottom which lead to an ornamental pond with an elaborate fountain. 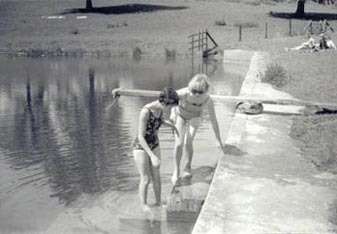 In the summer the lake was a big attraction for young and old alike. 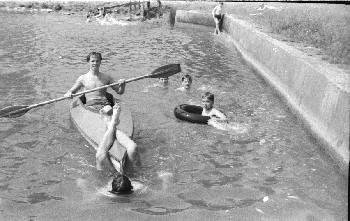 Most of us learned to swim in the lake. I learned after falling off the spring board. Miraculously nobody drowned. 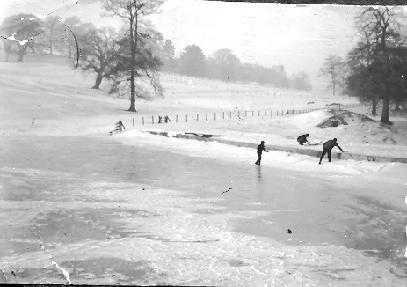 In the winter the lakes froze and we skated in the ice. There was also an ice house, a very intriguing structure, at the time we had no idea what it was for but we often used the entrance for changing into our swimming suits. 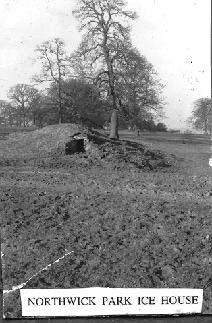 The ice house is still there to day. Enjoying the warm summers on Upper Water. On the left is the water fall cascading down from the lake. 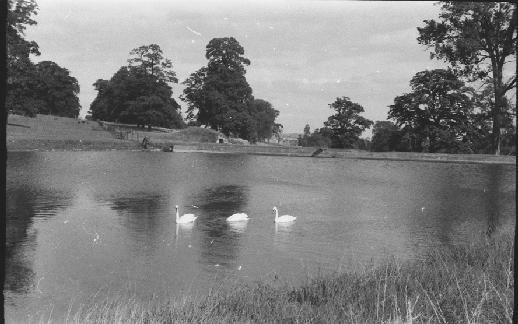 In the centre; swans on Upper Water with the ice house in the background and on the right the ornamental fountain, it never worked when we lived in the camp. The other lake was in the park next to the camp called Lower Water. This was a long narrow lake mostly overgrown with bull rushes. 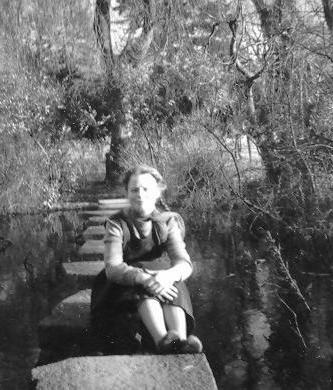 It had two islands on it with purpose built flat stepping stones leading to them and an old boathouse. 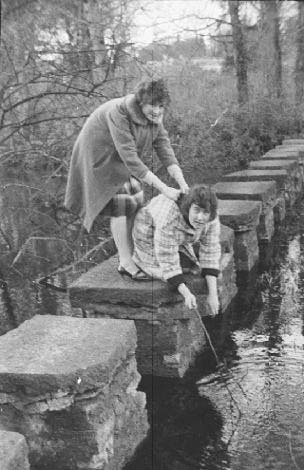 The stepping stones were great fun to run across without falling into the water. Many happy hours were spent fishing for sticklebacks from them and the islands made supper dens. The two lakes and fountain were all connected in some way, so that when the top lake was full the water cascaded down the waterfall and disappeared into the ground somewhere past the fountain and at the same time the bottom lake filled up. 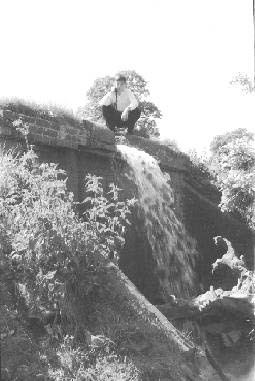 There was an overflow in Lower Water that carried surplus water into a stream which was full of fresh water crayfish. In very dry summers Lower Water became just a bog at one end and you could easily walk across it to the first island. The second island had stepping stones on both sides and it was always surrounded with water. With all the reads and rushes this lake was a haven for wild life. Swans on Lower Water with one of the islands in the background. Steppingstones leading to the island. 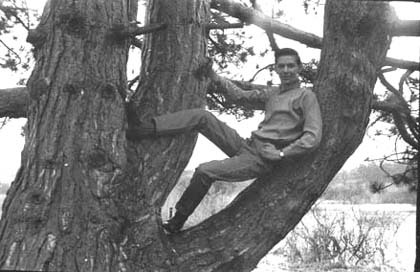 The cedar tree standing over lower water was a very unusual shape it was easy to climb and great for posing on. Far right photo taken from the island of the tree in winter and the lake frozen over. 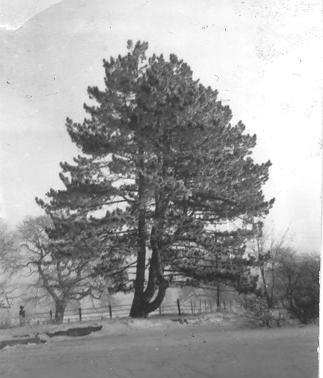 Centre; Janek Bołtryk by the cedar tree, you can just see the old boat house on the right. 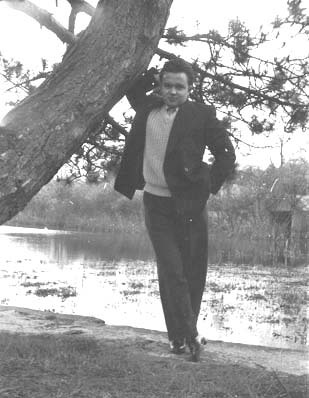 Top; Zbyszek Pajdzik posing on the tree.